The Havertown-Area Community Action Network (H-CAN) is a non-partisan, volunteer network dedicated to promoting progressive values in Havertown and beyond. We strive to make the world a better place by championing equality and inclusivity. 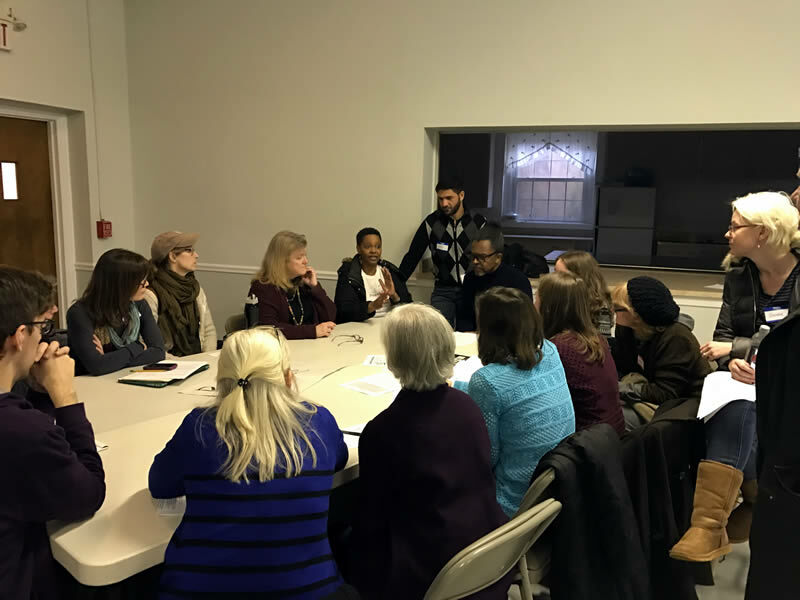 Our member-led Action Groups plan education, service, lobbying, social, and activist initiatives for our community. We are Havertown-area because most of us reside in Haverford Township, Pennsylvania, which is in the recently created 5th Congressional district and locally represented by a Commissioner in each of its 9 wards, but we welcome neighbors from the general area as well. Many H-CAN members prefer to meet in person to plan and then carry out actions. H-CAN was born the day after the 2016 presidential election. A small network of friends, all concerned about the outcome of the election, formed a Facebook group to begin to take action. In less than one week, there were 40 of us meeting in a living room in Ardmore. We began to organize and identify several different areas of action we wanted to pursue. We pride ourselves on being non-partisan, although we are committed to promoting our progressive values. Our members generally live in and around Havertown. Many of us have never been active in community organizing before. We meet as a group regularly because we feel that meeting in person is important to build relationships. If you are unable to attend meetings in person, you will find many other ways to take action. H-CAN as a group does not support or endorse any candidate or political party. As a progressive organization, our discussions may be a thoughtful format to discuss politicians and candidates, with the intent of determining whether or not their actions (votes, answers to questions, public statements, etc.) follow progressive agendas on particular issues. It is recognized and hoped by H-CAN that all politicians, regardless of party, have the opportunity to be progressive allies on some, if not all, issues. There should be no blanket statements about candidates or parties on our discussions. We do not wish to isolate politicians or candidates merely because of their party. An H-CAN member making a sign for the Show Up for Love rally after the tragic events of Charlottesville. We volunteer our time and talents to uphold the progressive values we feel are being threatened. There are many different ways to become involved and we welcome any level of participation you choose. We encourage you to follow your passion and share your experience and expertise with the group. 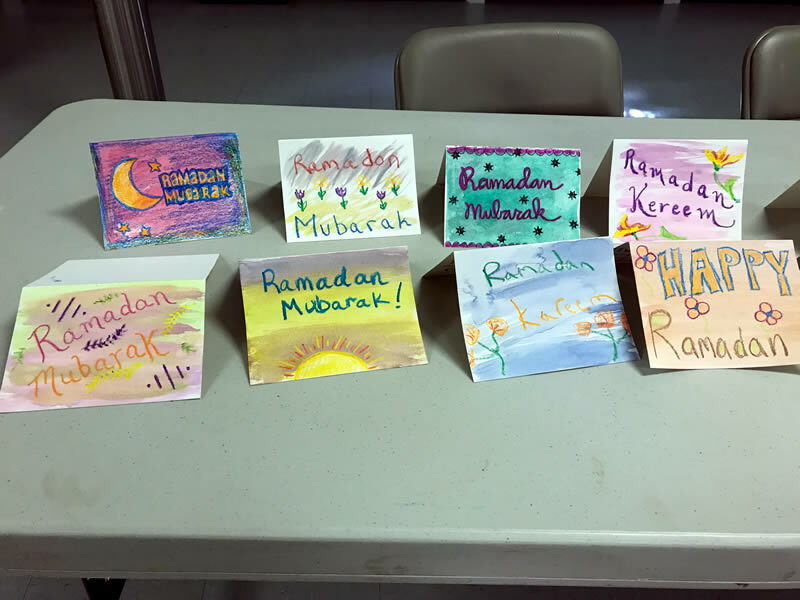 After a local mosque was threatened, H-CAN members and their children sent Ramadan cards to the mosque's congregation. Our core missions center around Action Groups. Action Groups create and host events and actions to which all other members of H-CAN are invited. If you have an interest or expertise in an area not covered by an Action Group, we invite you to start your own group! Want to join an action group? Join H-CAN or for more information contact us.